Sandilands fed the midfield all night with 41 hitouts and 20 to advantage. 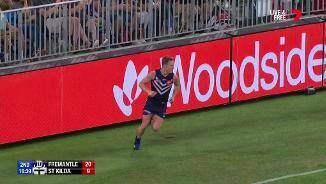 The combination in the middle of Sandilands, Fyfe and Neale was vital for Fremantle tonight. Fyfe amassed 36 disposals and 25 contested possessions, Neale had 32 disposals with 15 contested possessions. The pair also won 22 clearances. In the last 10 minutes, the Dockers lead disposals 47 to 15 and inside 50s six to two. Fremantle has converted 36 per cent of attacking midfield chains to a score compared to the Saints' 16 per cent. The Saints have laid nine tackles compared to Femantle's one in the final term. The ball has been in the Saints' forward half for 70 per cent of the last term. The Saints have kicked three behinds from their three inside 50s in the last term. A. Cerra has been important in the second half, kicking two crucial goals out of the Dockers' three in this time. 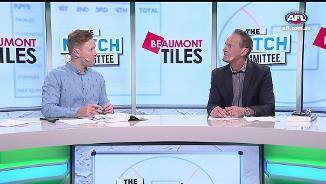 The Saints led uncontested possessions 70 to 43 and contested possessions 38 to 41 in the third term. 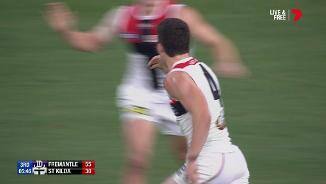 The Saints have dragged themselves back into the contest with a six goal to two third quarter. Three of their six goals were generated from chains in the attacking midfield. After trailing disposals 224 to 199 in the first half, the Saints lead third quarter disposals 106 to 72. 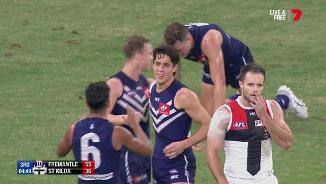 The Saints have now kicked the last four goals of the game; three of which were from Fremantle turnovers. The Saints have outscored the Dockers by 10 points from turnovers tonight, they average a differential of minus 13 points in 2018 (ranked 14th). Saints InterchangeDavid Armitage off due to the blood rule. L. Neale has had 16 disposals, six contested possessions and a goal across the second and third terms. The Saints lead third quarter disposals 40 to 20 and have just kicked their first goal since the 25th minute of the first term. The ball has been in St. Kilda's forward 50 for 23 per cent of the game compared to Fremantle's 19 per cent despite being outscored by seven goals. Sandilands has impressed in the first half with six disposals at 100 per cent efficiency, two contested marks inside 50 and nine hitouts to advantage (his second most in a first half this year). The Saints have laid seven tackles inside 50s to zero. 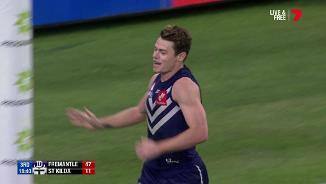 Fremantle has had 22 chains starting in the defensive 50 and converted five to inside 50s and three to goals. Fyfe has eight contested possessions in the second quarter and 13 for the game. That is his equal highest for a first half this year. The Dockers have now kicked four goals to none in the second quarter whilst leading inside 50s eight to four and marks 13 to five. Four of Fremantle's five goals have been generated from its defensive half. The Dockers average 30.7 points from this area in 2018. The Dockers lead second term inside 50s six to one. Saints InterchangeJake Carlisle and is possibly out for the game. The Dockers go from one end to the other in a flash to kick their first goal from a kick in. They average 1.1 points per game from kick ins (ranked 18th). Fyfe was influential in the first term, he had nine disposals, five contested possessions. He also won four clearances which is his equal most in a first term this year. The Saints are ranked last for goals per inside 50s, averaging a goal from 16.8 per cent of entries. It took them 11 entries to get on the board tonight. The Dockers have continued to dominate the throw in stoppages, they now lead throw in clearances seven to three and have scored two goals from this source. After 14 goalless minutes, the Dockers have kicked two goals from two inside 50s within two minutes. The Saints are yet to have a disposal in their forward 50 after eight entries. The Dockers have won four of the first five throw in clearances. The Saints are yet to score from seven forward 50 entries. They have averaged a score from 41.3 per cent of entries this season (ranked 14th). Jake Carlisle has four early intercept marks, which is already his highest ever in a first term. Since 2014, the Saints have scored from 54 per cent of their inside 50 entries against the Dockers, this the thirdhighest percentage recorded by any side. Fremantle has averaged 27 points per game from itsdefensive half intercepts this season (ranked fourth). Welcome to Optus Stadium for the Fremantle v St Kilda Round 8 clash. A HELLISH week for Fremantle has at least ended on a high note, but not without a scare from St Kilda at Optus Stadium. In a contest that never reached any great heights, the Dockers staved off a spirited St Kilda fightback and won 13.11 (89) to 8.11 (59), giving their fans something to cheer about after a controversial period in the club's history. 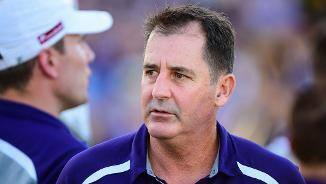 All eyes were on Freo's players after a nightmare week, when the club was forced to publicly back coach Ross Lyon and attracted more unwanted headlines after Bradley Hill's disastrously timed brush with police at a nightspot last Sunday. The Dockers would have been grateful to get back to football at their new fortress, and facing a Saints side utterly bereft of confidence – in the first half at least - was the perfect tonic. Fremantle dominated the sloppy visitors early and carved up Alan Richardson's men, whose 1.5 (11) was the club's worst opening half since 2002. Led by superstar Nat Fyfe (36 disposals 13 clearances), who probably pocketed three Brownlow Medal votes for the fifth time in 2018, and giant Aaron Sandilands (41 hit-outs), the Dockers commanded stoppages (39-29) and inside 50s (57-46) on the way to victory. Lyon lauded his senior players - including Lachie Neale, David Mundy and Alex Pearce – for ensuring the Dockers weren't derailed as the club works through off-field events. 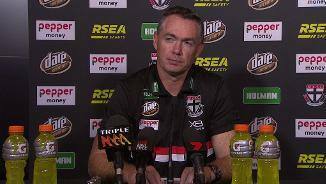 "It has been a challenging week," Lyon said post-match. "The president, myself and the CEO spoke to what sort of footy club we want to be and how we want to go about it, and that positive experience. "Obviously, game day is a part of it but winning doesn't paper over everything, so we've still got a bit to work through, and we feel like we're doing that. "But for a player group to stay focused and be well led is an important aspect." Lyon's men motored to a game-high 43-point break early in the third stanza but, with his side under the pump, Richardson coached from the bench and it seemed to inspire his troops. 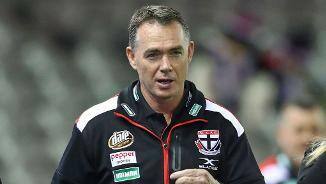 St Kilda hadn't even kicked more than 10 goals in a game since round one – the last time they tasted victory – but suddenly sprang to life with a blistering six-goal-to-two term. The Saints were close enough if good enough down by just 14 at the final change, but woeful inaccuracy again came back to haunt them. Tim Membrey (1.5) was the main culprit, pushing two straightforward set shots wide when the Dockers were on the back foot, taking his tally to 6.12 this season. 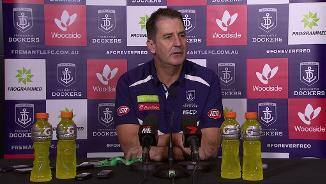 "Tim’s, historically for us, been as good a kick as we’ve had," Richardson said post-match. "He’s having some issues with his set shots there’s no doubt about that. He’s an outstanding contest player Tim, he’ll work through this. "He’s hurting, we’re hurting. They are opportunities he’d normally nail. No one works harder on their skill, his is marking and kicking and leading. "He’s a real pro so that will turn." Late goals to Darcy Tucker and Brandon Matera snuffed out the Saints' fightback, as Freo squared the ledger at 4-4 for the season and remained undefeated by an interstate side at Optus Stadium. The Dockers are still in touch with the top eight ahead of a potentially season-defining stretch against Sydney, North Melbourne, Collingwood and Adelaide. But the Saints have soul-searching to do, sitting 16th on the ladder with one win and a draw ahead of an extremely tough month. Sometimes hitting the road can be the circuit-breaker, but it wasn't on Saturday night. With Paddy McCartin worryingly sidelined by his seventh concussion, St Kilda sorely lacked any sort of threatening target in attack. The Saints' best player Jake Carlisle, who took five intercept marks in the first quarter, had to be thrown forward in the second term. 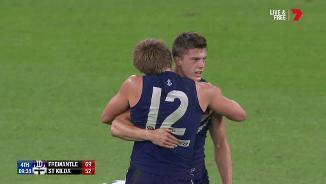 But it was a short-lived experiment, with Carlisle copping a knee to the head from Fyfe which ended his night. 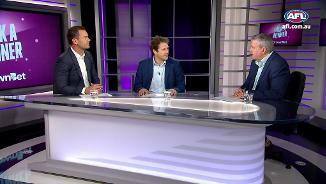 The incident and Fyfe's incidental head clash in a bump with Seb Ross in the third term might be scrutinised by Match Review Officer Michael Christian, although it would surprise if the 2015 Brownlow medallist had a case to answer. With his club under pressure, Fyfe stepped up again, while sidekick Lachie Neale (32 possessions, nine clearances) was also superb and Ed Langdon (33) continued his purple patch. Luke Ryan (27) provided valuable run from defence, especially with damaging half-backs Stephen Hill and Nathan Wilson sidelined, while youngsters Adam Cerra (two goals) and Andrew Brayshaw (16 disposals) impressed again. The Saints didn't have anywhere enough four-quarter performers, however Jack Steven (23) tried hard against Bailey Banfield's tag, while debutant Ed Phillips (24) showed some good signs alongside hard-working Jimmy Webster (31) and Luke Dunstan (26). 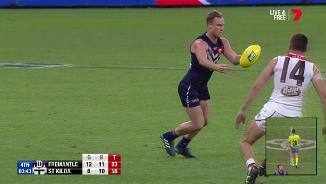 Fremantle: The Dockers lost Stephen Hill to quad tightness before the match, with the classy half-back failing to overcome the issue from last round's loss to Richmond. Hayden Ballantyne suffered a corked thigh but it doesn't appear anything major. 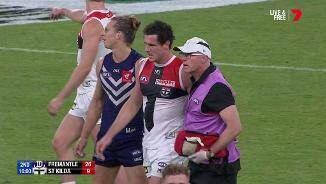 St Kilda: The Saints' best player Jake Carlisle had his night ended early in the second quarter after he was collected on the side of the head by Nat Fyfe's knee. 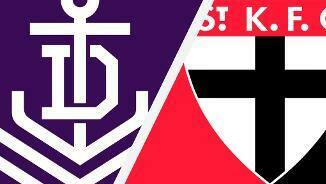 The Dockers hit the road to face the Swans at the SCG, where they haven’t won since 2011, while St Kilda returns home to Etihad Stadium and take on in-form Collingwood to kick-off a tough month.